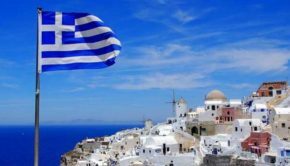 Greek holidays this summer? Don’t miss out on an amazing boat trip to the wonderful Navagio Beach, just off Zakynthos Island, one of the biggest of the Western Greek Islands. Magic, to say the least, is what you will experience on the shores of this terrific corner on Earth! Greece is one of the most sought after European destinations for summer holidays. And the Greek Islands can only prove this thought. Small gems scattered around an amazing Mediterranean Sea, they all bear their own charm and magic. 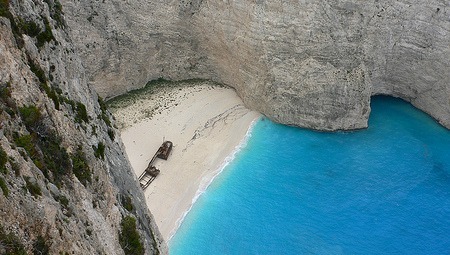 When you visit Zakynthos, a trip to Navagio Beach, that is, the Shipwreck Cove, is a must. It is located on the north west shore of the Island, and everything there – starting from its name – is wrapped in wonder. Many travel guides agree that Shipwreck Cove is the most photographed place in Greece, getting even more attention than the Acropolis of Athens or the Parthenon. Navagio Beach is the most famous beach in Greece and can only be accessed by boat, but is well worth the trip. The Greek word Navagio literally translates to “shipwreck.” The cove was so-named because of the remains of the ship Panagiotis which ran aground at this spot some time in the early 1980′s and was left to become a permanent part of the picturesque landscape. The beach is also referred to as Smuggler’s Cove. Indeed, it is said that the boat was shipwrecked after hitting rocks in bad weather while being pursued by the Greek Navy who suspected it was carrying contraband cigarettes. However, there are also those who believe that the ship did not wreck there at all, and was just placed there by the Greek Ministry of Tourism. Well then, if it was the Greek government, it has definitely been a successful experiment. 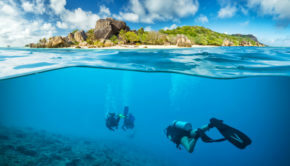 Despite its relatively remote location this beach attracts thousands of visitors each year: the reason why is curiosity for the wreck on the shore, of course, and the beauty of the white sand surrounded only by limestone cliffs and crystal clear water. Navagio Beach is enclosed within large steep cliffs, so it’s quite impossible to walk to the beach, instead you will need to take one of the water taxi tours from Porto Vromi, located to the south of the beach, or catch a boat from the Harbor of Saint Nikolas in Volimes, located to the north. 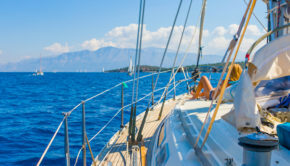 You can also take a boat from island’s capital city of Zakynthos. 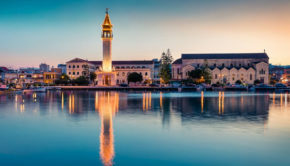 If you’re planning to stay there for more than 1 hour, it is advisable to bring all necessities with you, as there are no facilities in the bay. Heat radiates off the white cliffs and there is no shade on the beach, so first of all don’t forget a sun umbrella, and fresh water!